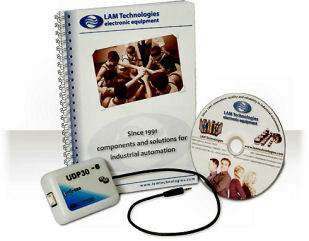 The UDP30 interface enables communications between a PC and any device equipped with a DUP port. The DUP port is a proprietary interface, developed by LAM Technologies, designed in order to simplify the configuration of its own products and to allow a fast reading, and in real time, of device status and diagnostic information. The connection to the PC is through any USB port, from which the interface takes the power supply to operate (no external power supply is required). Unlike a common serial connection, the USB port offers a higher speed and and intrinsic errors control system. The supplied software is suitable for the following operating systems: Windows 98, Windows ME, Windows XP x64, Windows XP, Windows Server 2003, Windows Vista, Windows Server 2008, Windows 7 (32bit and 64bit).